On a recent trip to New York City, I indulged myself on a variety of fabulous, though fattening foods. I do this occasionally so that I can find amazing gourmet dishes and then make them over into healthier versions that are lower in Points, so they’ll be more Weight Watchers friendly. At one restaurant, I had a banana crème brulee for dessert. Now, I’m not really a huge banana lover, but something about this dish really made me start craving bananas something fierce. I decided that some simple banana chips might be a good solution to the craving. 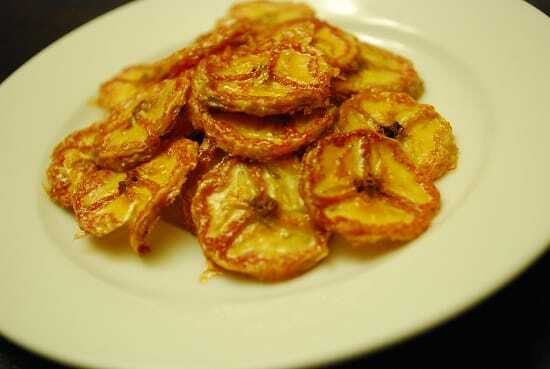 But typical banana chips are fried and pretty caloric, thus high in Weight Watchers Points. So, I decided to try baking them, and I was very pleased at how YUMMY they were – and they were so much better than the fried banana chips! Granted, the texture was more chewy than crunchy, but slow baking the banana chips allowed them to caramelize which made them taste like they were glazed with caramel. SO good. Though I like to eat them straight up as a snack, they’d also make a great topping for oatmeal, ice cream or on toast with peanut butter. They do take some time to bake, so if you like them I’d suggest making a big batch and freezing some so that you’ll have some on hand in a jiffy if your sweet tooth strikes. A healthy and delicious snack recipe, these Baked Banana Chips have a delicious caramel-like flavor that and is a great low Points sweet tooth satisfier. Place bananas into a small bowl and squeeze orange juice over top, very gently tossing the banana slices enough to evenly coat with the orange juice. Lay banana slices flat on baking sheet, and bake for about an hour, flipping over slices about half way through. Note that the texture will be a bit chewy, and not quite crunchy like fried banana chips. I put the recipe into WW expecting it to come out 0, but it actually is 7 points for 2 bananas. I hate how something you think is low points bc it’s fruits or veggies has a ton of points just because it’s added to a “recipe”. I also tracked all three of the clementines I ate together as a recipe just to see what it would do and it says 6 points! Do you know why it does that? Not sure what WW app you are using but, I just went onto my iphone WW app and entered bananas and kept increasing the # of “extra large” bananas. I got all the way up to 100 and it still came up to ZERO.?.?.?.? I put it in as a recipe. For some reason when you put it in as a recipe it ends up being worth a lot of points. If you baked it like half an hour or so longer wouldn’t it crisp them up more? Delicious! Also tried unsweetened apple juice/cinnamon on a second batch- delicious as well! I used overly ripe bananas and just cooked them longer (a good 30 minutes extra) and turned on the broiler on the last couple minutes. I was still very, very happy with them! Thanks!!! I’m confused about this recipe. I thought if fruit was cooked in any way, it then became points? I baked mine at 200 for 30 minutes and then I raised the temp to 375 for 40 minutes…..they are awesome, I can’t stop eating them! I’m not sure what I did wrong, but mine turned out gray and they taste like diapers!! I guess banana chips just aren’t my forte lol! Do these store well? or you have to eat them right-away? They only store well if you freeze them, and then eat them semi frozen…they are actually really yummy that way. But if you just leave them out or in the fridge, they get really hard and chewy. The banana chips are made with green plantains , I wonder if you can do them bake like the sweet potatoes chips…..
Did you use just regular bananas? Or plantains? I’m thinking this would be awesome with ripe plantains like they fry for Cuban food. I just used regular bananas, but plantains sound delish!! Great idea! For plantains, you can also add spices to give them a little kick!